If you're looking for a seasonal salad with a nutritional powerhouse kick, look no further than this, either to grace a holiday table, or for a burst of health in between the sugar-laden days of the holiday season. Kale is the popular super-food of the moment. Raw kale is particularly vogue. Those two reasons, along with personal curiosity, inspired me to try this raw kale salad (recipe inspired by a Vegetarian Times recipe). And while I enjoy kale slow sauteed with onions and spices, as well as pureed in green soup, I did not find the raw version up to my particular taste buds. Don't get me wrong, it wasn't bad, in fact this salad is loaded with lots of flavor and the health benefits are numerous, I just know kale is a vegetable I'd rather eat cooked. However, I hear rave reviews of raw kale, so give this a try, you're body will thank you and perhaps you'll find that raw kale is your style of salad! Place kale in a bowl, and pour olive oil, vinegar, and salt over top. Using your hands, gently massage mixture into kale for 2 to 3 minutes. Let rest for 30 minutes. Preheat oven to 375°F. Line baking sheet with parchment paper. In a bowl, toss together pecans, maple syrup, olive oil, dash of salt, and dash of cayenne. Spread nut mixture in single layer on baking sheet; bake 8 to 10 minutes, or until pecans are brown and fragrant, stirring frequently. Cool in pan. To make dressing, whisk together all the dressing ingredients and season with salt and pepper, if desired. Stir turnip, carrot, and green onion into the kale mixture. 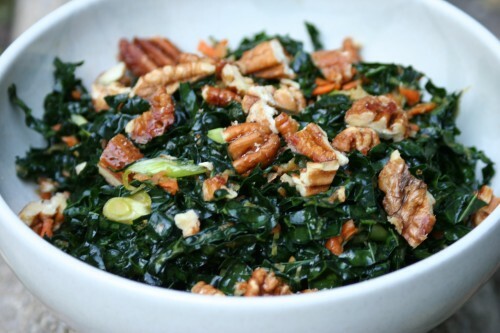 Toss with dressing and garnish with pecans. This looks fab! So can't wait to try it and perfect for this time of year, as you say! YAY!!! Can't wait to see all the new recipes! The kale salad looks delicious!! !